After a controversial 2015, Perth Glory Football Club has unveiled its new four-year strategic plan to set it up for future success, both on and off the field. a hefty challenge. The team had just experienced its most difficult and controversial season to date, with a salary cap breach causing it to miss out on the finals, despite leading the competition all year long. Luckily, he was up to the task, with more than two decades’ worth of experience in the sporting industry behind him. Now, more than twelve months later, Perth Glory is entering an exciting new phase under Peter’s leadership. The organisation has set out a clear vision of where it wants to be in the future and is taking the steps to become an even greater club both on the soccer pitch, and off it. 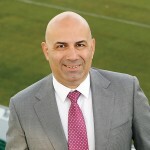 The strategy which Peter and his executive team unveiled was titled ‘The Perth Glory Way’ and it outlined the organisation’s overarching goal to be the leading football club in Australia. The three key pillars underpinning it are: Stakeholder and Growth; Football; and Engagement. “We want to be a club that all Western Australians are proud of, that’s one of the outcomes we hope will arise from the new strategy,” Peter says. “We are focusing on making bigger things happen on and off the field so that our people are successful and bound for glory. Some of the milestones we want to achieve are to sign up 10,000 members, and to have an average of 12,500 people in the crowd at our games. We want to increase our revenue by $3 million dollars within those four years, and we are also working closely with the government to develop a state football centre — a training and administration headquarters that caters to all of the needs of football in Western Australia. Furthermore, we want to engage at least 50 per cent of the 42,000 people that play football in Western Australia, either as fans or members. Peter is confident that the club will retain this positive reputation well into the future as it grows and prospers. He says that the passion that he shares with the people involved will be the key driver in Perth Glory achieving all of its future pursuits. “My biggest job every day is to unite every person on the one path, aiming for the same outcome.